You can export weekly shift information from each weekly schedule view. Most weekly schedule view exports (Calendar Weekly, Sortable List,	Graphical) include the Helper, position, shift begin and end times, per shift. The Statistics schedule view Export includes the Helper name and total hours helped for the week. 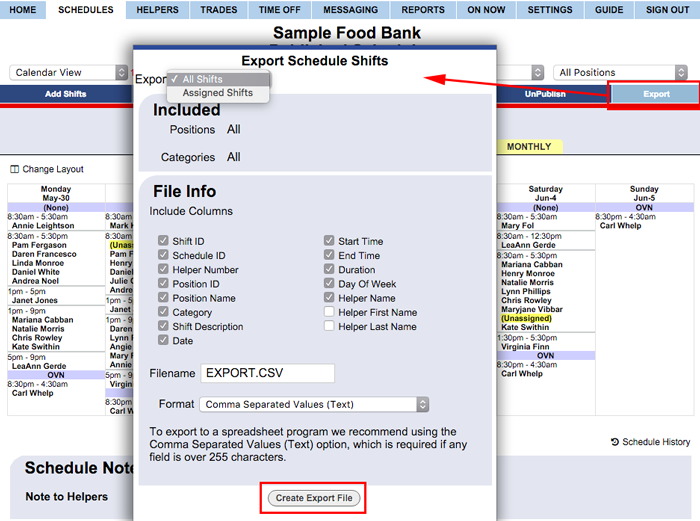 The Reports section includes "Custom Reports" and creates exports based on date ranges and what you want to include so that it can be used in other programs. You also can Export your Helper data from the Helper List page.